Zing Rust is a contemporary hand made typeface created by Stan Partalev together with Svet Simov and published by Fontfabric which is available in 238 fonts. It was designed based on layer combitations. You can mix them and create beautiful things. With moderate proportion is ideal for logo, headline, text. Also it merge perfactly for editorial purpose, display, packaging, print etc. Enjoy! Styles: Base, Shadow 1, 2, 3, 4, 5, Base 2 Line, Base 2 Line Shadow 1, 2 ,3, 4, 5, Regular, Line, Diagonals1, etc. 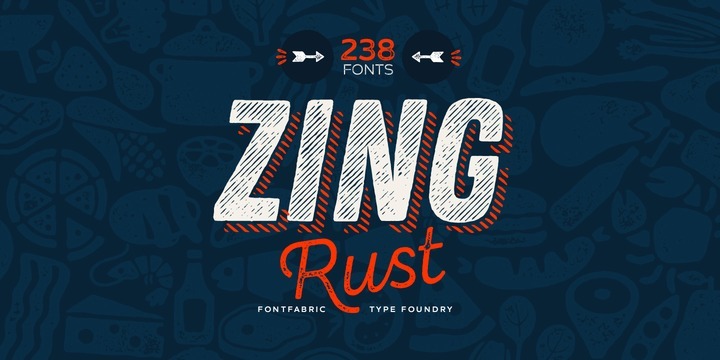 Note: “Zing Rust” is a trademark of Fontfabric. A font description published on Friday, December 15th, 2017 in Fontfabric, Fonts, Stan Parlev, Svet Simov by Alexandra that has 2,004 views.